Wireless IC - Adopting powerful wireless chips, extended with power amplifier (PA) and low noise amplifier (LNA), can maximize the system output power while reducing the system noise factor, thereby improving the signal coverage. All-angle antenna - The transmitter uses excellent linear all-band gain antenna, can greatly improve the transmitting efficiency, thereby enhancing the stability of the R/C system. The receiver adopts diversity antenna, combined with the signal detection and switching algorithm, the receiving signal is stable and reliable. Suitable for various aircrafts - It is suitable for airplanes, helicopters, multi-rotors and other aircrafts. Fast response - The response time is only 2.6ms, even 8 channels it acts synchronously. Long distance remote control - The R/C system adopts 2.4GHz direct sequence spread spectrum (DSSS) and multiple frequency-hopping spread spectrum (FHSS) technologies, has high receiving sensitivity and strong anti-interference capability, can support a stable remote control for more than 1,000 metres on the ground and more than 1,600 metres in the air. LCD - 192x96 high-resolution dot-matrix LCD screen, providing with easy to understand menu, it is very simple to use. Unique ID code - Each transmitter has an individually assigned, unique ID code. Once the binding is made, the ID code is stored in the receiver and no further binding is necessary after restarting the receiver. 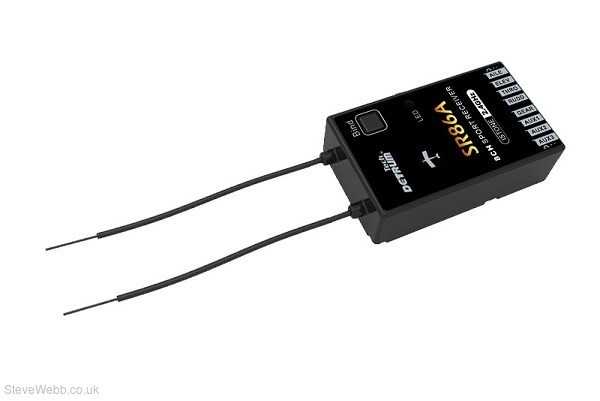 When the receiver is working, it will verify whether the ID code of the transmitter is being paired, to enhance the stability of the R/C system. Fail safe function - If the aircraft flies out of the remote control range and cannot receive a valid RF signal from the transmitter, the receiver’s outputs can be driven to their preset failsafe positions. High section precision - By using the 4096 section precision sticks, you can experience a smooth and exquisite flight operation. Low voltage alarm - Detecting the input voltage of the transmitter in real time, it will alarm in advance when it is low battery voltage. This will bring greater security for flight operation. USB Upgrade - Upgrade by a USB cable helps GAVIN-8C always keeps the latest program. Setting the programmable items of flight controller for airplane - When working with SR86A sport receiver which is integrated with 6-axis gyro, GAVIN-8C can be used to set its programmable items in real time. For example, roll/pitch/yaw gain, flight mode, wing type, etc. Then you can set the programmable items for SR86A conveniently. Control Algorithm - Original airplane attitude stabilization algorithm and control algorithm. Support normal wing, fly wing, V-tail airplanes, and 3D planes. 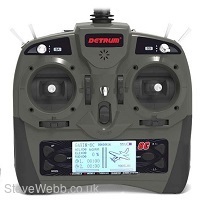 Flight Mode - Four flight modes: Gyro off, Normal, Aerobatic, and Auto-Recovery (Auto Balance). You can switch between different modes by the toggle switch. Adjusting the Gain - Set the gain and other programmable items with matched transmitter. High Sensitivity - SR86A adopts 2.4GHz direct sequence spread spectrum (DSSS) and multiple frequency-hopping (FHSS) technologies, having high receiving sensitivity and strong anti-interference capability. Diversity Antenna - By using diversity antenna, combined with the signal detection and switching algorithm, the receiving signal is stable and reliable. Unique ID Code - Once the binding is made, the ID code is stored in the receiver and no further binding is necessary after restarting the receiver. Fail Safe - If the aircraft flies out of the remote control range and cannot receive a valid RF signal from the transmitter, SR86A’s outputs can be driven to their preset failsafe positions.